In 1898 Kenya, the construction site of a railway bridge over the Tsavo River is terrorized by two man-eating lions so vicious and elusive they become known as THE GHOST AND THE DARKNESS. At the sprawling site, Paterson is aided by Welshman Angus (Brian McCardie, who can’t stop reminding us of Ewan MacGregor), Dr. Hawthorne (Bernard Hill), African supervisor Samuel (John Kani), and lead Indian Abdullah (Om Puri, channeling F. Murray Abraham in a dhoti). 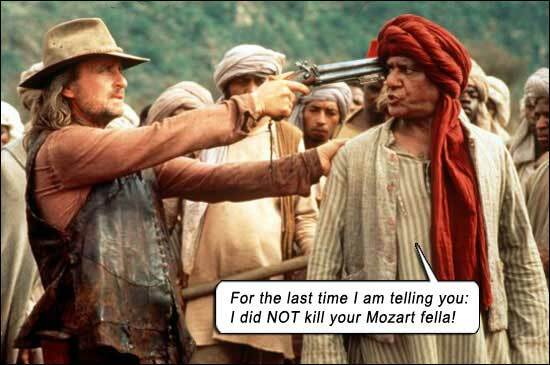 And there is an African worker who once killed a lion with his bare hands – no wonder, he’s Henry Cele – SHAKA ZULU himself! A lion continues to drag off victims in the dark of night, with all Paterson’s trapping methods going awry – thorn fences, fires and ambush cages. Until it is discovered there are two lions, grown so audacious that they attack in daylight, just diving into the midst of a crowd and taking someone! Maneaters usually hunted solo, so this dynamic duo were rare, and became known as The Maneaters Of Tsavo. Until Michael Douglas. Hot off THE AMERICAN PRESIDENT and DISCLOSURE, Douglas strides into camp one day as grizzled Mad White Hunter Charles Remington, called in by The Company to aid Paterson. A cross between Indiana Jones and ROMANCING THE STONE’s Jack Colton, it’s a flamboyant role that Douglas eats like candy – and is entirely fictional! Somewhat diluting the hero’s presence, this foil was necessary so the hero could fail in front of this master hunter and then rise to become the killer of giants – screenwriting rules! Ptuh! The most powerful man on set – the LION TRAINER! Magnificent shots of the two regally maned, iron-thewed lions, thick and furry, with heavy-chested roars, tan-muscled fury and blood-tinged jaws. I love these scenes! And I love the look of the film (cinematography Vilmos Zsigmond: DELIVERANCE, CLOSE ENCOUNTERS); the African continent so wild and primal; that beige shifting grass, the predator sneaking amongst it, such unforgiving power! Lions will attack anything – how do they “know” they are more powerful than Cape Buffalos or elephants? Our worship and primordial fear of this species, built to eat, breed, dominate, is at the base of our limbic system; we were once unformed and unprotected on the iron veldt. It’s where we are from. GHOST AND THE DARKNESS came at that midpoint between stock footage (where wildlife scenes could never be properly married to real footage) and CGI (where wildlife could never be properly married to real footage). The film claims Tsavo means “place of slaughter” – but it is derived from the Maasai word for river. The area itself is called “a place of slaughter” but refers to tribal warfare in the area, not, as implied, a place where lions feast on human flesh. The lions are simultaneously the best thing about the movie – and its biggest lie! In nature documentaries, lions and other predators are usually villainized. As are any animals who kill humans – even if the humans are encroaching on the animals’ territory! (That’s another discussion on humankind’s narcissism, selfishness and the pathological need to self-aggrandize.) But here, the lions are – ahem – lionized! The movie shows them as gigantic, robust, healthy peak specimens. Because if a lion hunts Man – the apex predator – well, then, he’s got to be the fittest of the pride. BLARP! Wrong answer! Thank you for playing! It’s exactly the opposite: maneaters are the pariahs of the pride, usually ostracized due to old age, turning to scavenging to survive. Mankind placing an inordinate worth on itself again: if a lion is eating Man, it must have risen to that pinnacle of diet. When in fact, it is hunting Man because it is too decrepit to hunt gazelle any more. Man is the easiest prey. The Lions of Tsavo. The Field Museum of Natural History, Chicago bought the lions’ skins and rebuilt them for display. Their skulls are also on display separately. Paterson claims the lions took 135 lives, but the exact number is unclear, somewhere around 35. 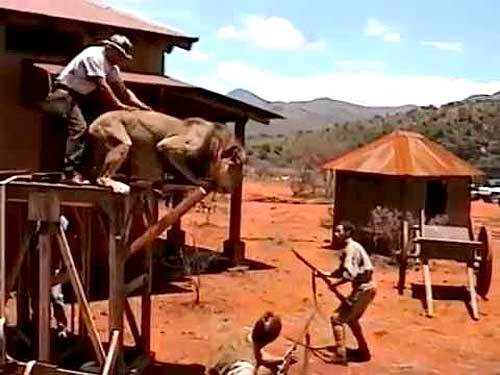 Movie treats the lions as “evil” – but they were just trying to survive. 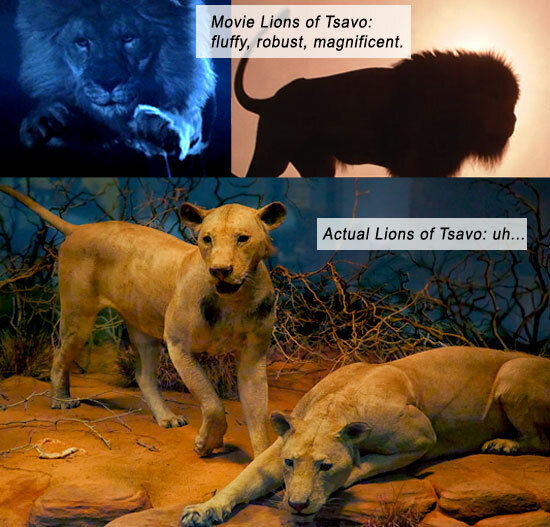 Movie also portrays their Fabio-friendly waterfall-flowing manes, but the real lions were mane-less, from scavenging through thorns and bushes, and if their museum-mounted images are anything to go by, they looked more like starved dogs than big cats. Taken down by a Gekko and a Bat. Starring: Michael Douglas, Val Kilmer, Tom Wilkinson, John Kani, Bernard Hill, Brian McCardie, Emily Mortimer, Om Puri, Henry Cele.